Bolts to existing draft hood (fan included). Must use 5-amp fuse. Application: Ripple Front Door (s/n 13428 to s/n 19125). Do not use CL 7260 High-Output fan (p/n 5549) if a burner has been installed on the outdoor furnace. The 203 Blower & Motor, 1/15-hp can be used if a fan only is needed for the high output draft inducer. Draft Inducer (p/n 700) - 180 cfm; Draft Inducer (5549) - 450 cfm. Draft inducer application by model serial number range: Side Draft (p/n 400) - up to s/n 13427; Ripple Front Door (p/n 500) - 13428 to s/n 19125; Flat Front Door (p/n 700) - s/n 19126 and later. 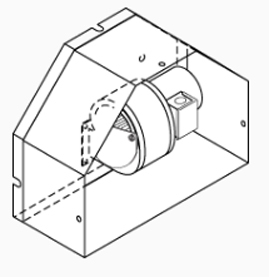 NOTE: If the outdoor furnace does not have an inner shield on the inside of the draft opening, it will be necessary to install Inner Shield Kit (p/n 553) before installing the Draft Inducer Kit (p/n 500).